The Q Series includes Seeking the Mythical Future, Through the Eye of Time and The Gods Look Down.An acclaimed scientist is chosen to travel through alternate futures to find safe haven - and instead, finds a totalitarian world of dictators and concentration camps . . .Christian Queghan is a Myth Technologist, a highly respected scientist on Earth IVN. Like so many other worlds colonised generatio… ns ago, the planet was created to be as much like Old Earth as possible - even though Old Earth itself is now pretty much a myth, the stuff of legend. But Earth IVN has its problems too.Now a machine has been developed to project a researcher into one of the infinite number of possible futures of Earth IVN, and Christian Queghan is the ideal subject. He can't resist the idea of going where no man has gone before, but there are an infinite number of possible futures, and no guarantee of a safe return.On a parallel world, a strange, translucent figure is found floating in the blood-red ocean on a craft of scorched metal. Could the alien's claim to come from the future be true? 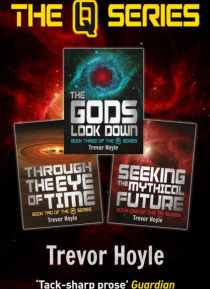 Or is this totalitarian world of dictators and concentration camps a dream projection from another dimension?The Q Series is an epic science fiction adventure through parallel worlds.